Help your child’s short-sight in just 1 minute a day!! By using MiSight myopia control contact lenses and vision therapy, we have been able to virtually stop the worsening of myopia in some of our patient’s eyes. Myopia is a common condition where the eyes are focused too close, this means that the sufferer can’t see far away objects, such as looking at the board at school. It usually starts from the early teens but recently we’re seeing many kids where it has started at a much younger age. Even as young as 5. What are the risks of myopia? High levels of short sight significantly increase the risk of serious eye diseases such as retinal detachment and glaucoma later in life. It also makes extremely difficult for your child to see the board at school without glasses. Short sight doesn’t just affect a child’s ability to learn at school. It can affect playing sports and other activities. In many cases I’ve seen, it can impact confidence and the ability to interact with others. These children suffer low esteem and, despite the Harry Potter effect, often get teased about wearing glasses. If you’re short-sighted, then you already understand how the condition gets progressively worse so you need stronger glasses every 6 months. You’re probably aware of struggling to see without your glasses on. Luckily, we now have a revolutionary and scientifically proven option to help slow down the progression of myopia. In about 41% of cases, there was virtually no change at all! Myopia control contact lenses are proven to be effective in kids from the age of 6 in slowing down the progression of myopia. Why is the approach to Myopia Control at Central Vision Opticians different to other optometrists? In addition to the optical effect that drives short-sightedness, we have found there is a significant link with difficulties in focusing and binocular vision. As Behavioural Optometrists, we are trained to assess the visual system to a deeper level and providing vision therapy to improve these problems can reduce the change in myopia. 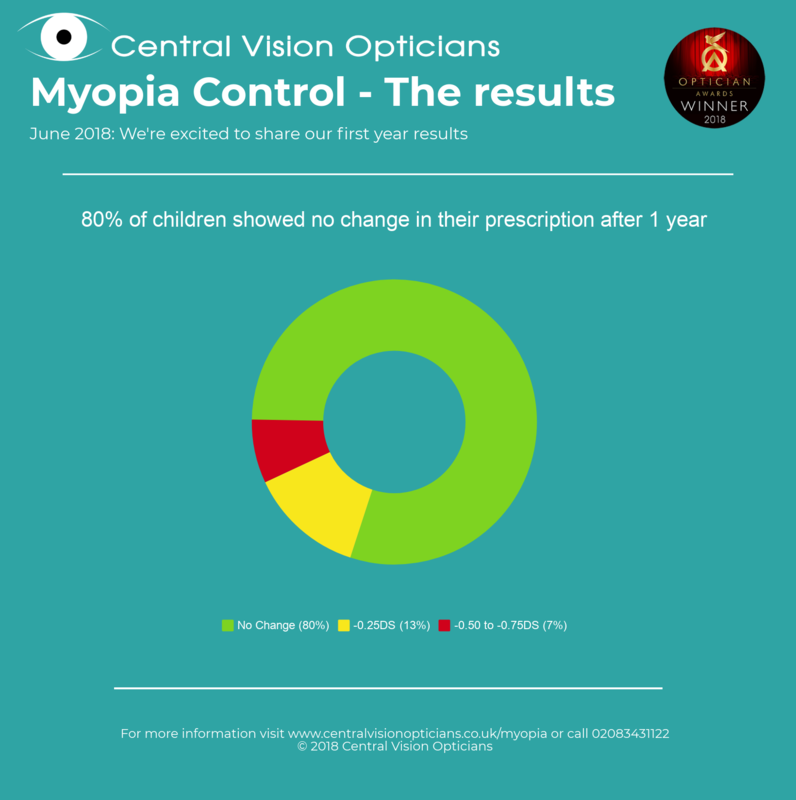 Central Vision Opticians are unique in offering a myopia control programme with vision therapy in addition to contact lenses. Children can wear contact lenses, even at the age of 6? Yes! We have several 6-year-olds who are successfully wearing contact lenses and their eyes have virtually stopped getting worse. You were very supportive, patient and understanding. You explained the process and showed us how to fit lenses in, answered our questions. But how can they put them on their eyes? We teach them exactly how to insert and remove the lenses safely. Bhavin has been amazing and really explained the pros and cons of wearing the lenses. He has also been very patient with Rian especially at the beginning. Although we were a little apprehensive at the beginning we found that young children are very good at handling lenses and age should not be a barrier. What if they get an infection? They are single use so every lens they wear is sterile and clean. The risk of an infection is virtually eliminated. 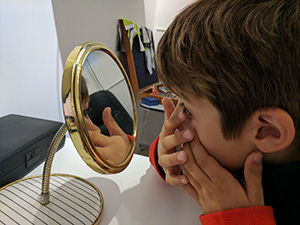 We’ve found that children get into good habits of washing their hands and looking after the lenses at a young age which helps when they are older. In fact, the risk of infections is lower than some adults. For reassurance, we offer unlimited emergency appointments if ever there is a problem. Can they damage my child’s eyes? We ensure that children learn how to look after their eyes and lenses very carefully before we let you take them away. We also monitor their eyes frequently so we can identify any problems before it can cause damage. We take eye care very seriously. In over 20 years, we have never had a wearer on our regular replacement scheme who has had damage to their eyes from contact lens wear. What is the proof that these contact lenses work? These techniques and contact lenses have been development for over 10 years. There have been published studies that have followed children for over 4 years while wearing these lenses. The children responded very well to lenses. About 40% of the kids had no increase in short-sightedness. The other 60% showed a change of just -0.75DS over 3 years. Just to put it into context, children who wear glasses would have an average change of over -1.50DS. That’s nearly twice as much change. How are these lenses different to normal contact lenses? Research has found that there is an area of blurry vision in the periphery of our vision that drives extra growth in the eyeball. This leads to the progression of myopia. When you are short-sighted, this area of vision is one of the factors responsible for the changes. It doesn’t matter if you wear your glasses or not, the vision can still get worse. These lenses change in the vision in the periphery while still keeping the central vision clear. This suppresses the additional lengthening of the eyeball thus reducing the rate of change. Can the short-sightedness be reversed? Not yet, although we have had a couple of cases where a child needs a prescription that is slightly less strong. The prescription will increase but at a significantly slower rate. What about lenses that you sleep in overnight (Ortho-K) to prevent myopia? In overnight wear contact lenses, there is evidence to show that the prescription gets worse again if you stop wearing them. Studies show that the reduction of myopia with MiSight daily lenses is permanent. There is also a significantly higher risk of infection when you wear lenses overnight. Not at all! They are extremely comfortable once they have been applied to the eyes. We offer a free comfort trial so your child can feel how comfortable lenses are before we conduct the consultation. How do I know if my child will be able to wear lenses? This is easy. We offer a free comfort trial when your child has a sight test with us. This means we’ll apply the lens to their eyes and see how they find them. At this point, 93% of kids are keen to proceed with the lenses. As long your child is comfortable, we perform an assessment and consultation to ensure the fitting is good and the teach them how to handle the lenses. This includes looking after them and applying and removing the lens. As part of the consultation, we give you a week’s supply of the lenses to use at home and school. We perform final checks at the end of the trial to make sure your child is 100% happy and that the lenses are safe for your child to wear. The lenses are received every 3 months and paid by a monthly subscription. This includes any check-ups and further appointments necessary, so you can have peace of mind. When can they stop wearing these lenses? Short-sightedness can be a risk until the late teens so wearing the lenses until the age of 18 is important. Most people prefer to wear contact lenses after this age because the vision is clearer and can be more comfortable than glasses. How long do they have to wear the lenses each day? The myopia control works best when a child wears lenses at least 10 hours a day, they can wear them longer. The lenses need to be worn at least 6 days a week for maximum myopia control. We are very happy with Central Vision, it is a friendly and family-oriented optician. That’s exactly what we were looking for. I’ve been telling other parents about contact lenses and passing all the information you have given us. What is the cost of protecting my child’s sight and vision? 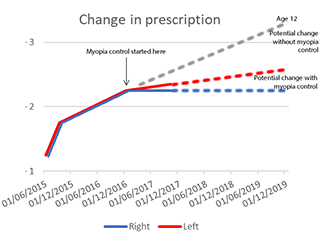 Myopia control lenses are cheaper than the alternative of not stopping the rate of change. Myopia puts a significant risk to our eyes and sight. The emotional impact of wearing spectacles can affect many children. The ability to participate freely in sports and activities cannot be underestimated. We would highly recommend the lenses to other parents with children in the same situation. Myopia increases the risk of several diseases of the eyes including glaucoma and retinal detachment. By controlling myopia, this risk will be reduced. These contact lenses are easy to use. Daily replacement means that the risk of infection is extremely low.